The Fall 2018 issue of the Rutabaga is out! News from the Board and updates on the Managers team, supporting local and regional farms, articles about the environment, wind turbines, picky eaters and a recipe for Cornmeal and lime cookies (yum!). Read the new Rutabaga Rap here. 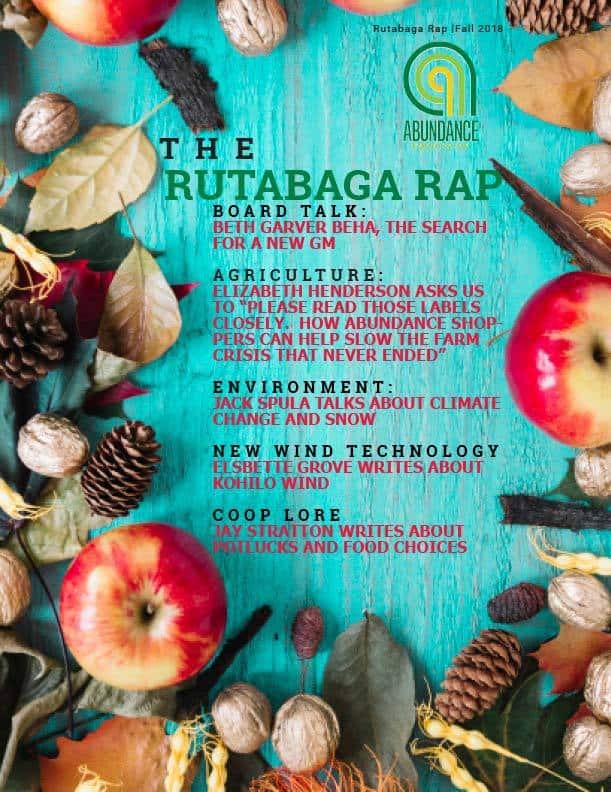 The Rutabaga Rap is Abundance Food Co-op’s quarterly newsletter. With articles, notes, and recipes, we explore the food, values, and way of life that matter most to our co-operative community. Want to write for the Rap? Now accepting submissions for the WINTER ISSUE. The deadline is January 8th. Call (585) 454-2667 and ask for Torin Washington or Ty Burrs.